My wedding has come and gone and I just wanted to come back and say I'm so happy that I had a chance to get my dress and all my bridesmaids dresses from Mjmweddings.It was so nice to be able to come there with my kids and not feel like they weren't wanted...even the kids loved Myrna. I was able to get a great dress for an affordable price and felt confident my whole wedding day! Thanks again Myrna I'd recommend you to ANYONE!!! I just want to say thank you so much Myrna for all your help with my wedding planning from my dress to my bridesmaid dresses and all the beautiful invations I got from you. You made my day that much more special. I would reccomend anyone to you. Everyone commented on how gergrous my dress looked and the girls at the reception said that's the best one they've seen in a while. Thank you again and if your thinking of who to go with. I am telling Myrna's the one, you will be nothing but grateful and pleased. Thanks, Myrna, for all your work on the wedding. I especially appreciate you finding time in your schedule to steam the bridesmaids' dresses just before the wedding on such short notice. My only regret is not finding out about your business before I bought my own gown. MJM was great for a number of purchases: invitations, veil, and 5 bridesmaid dresses. Great way to go. Pictures to come! Thank you Craigslist! I found Myrna's great place through an ad on Craigslist and wow, am I ever glad I did. Found a dress I LOVE the first time I went there. She even let me put it on hold to think about it...what other salon will let you do that! None of the snooty ones in New West, that's for sure. I am also ordering my bridesmaid through her...we are having a custom replica made up of a style I like. Anyways...check her out! It is worth it. OMG Myrna thank you so much for tonight. We had so much fun and now thanks to you I have found the dress of my dreams. Thank you Thank you Thank you!!!!!!! 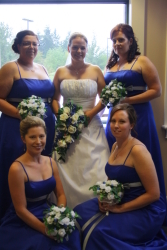 We will be back for the other dresses for the bridesmaids and Flower girls. I loved the atmosphere and how nice and easy going you were with us. Thank you again so very much!!!! I just wanted to tell you all to give Myrna a try. I got married almost 4 years ago and I am still telling people about her. Way better than those stuffy shops in New West and her prices & hospitality can't be beat. You can't go wrong! Myrna has the best bridal shop I have ever been to!!! It was so easy and comfortable finding my dress there!! and I loved how I was able to take pics! I can't wait for my gown to arrive! You really have an amazing shop, we are managing to get all our dresses and accessories all in one stop! Truly wonderful! Thank you for making the experience so comfortable and relaxed for us. Hi Myrna...what a fun time we had at your place! Thank you. I'll let you know when I am ready to order my beautiful gown...I am soooo excited.